Accolade is a popular ornamental cherry tree, characterised by its graceful spreading habit, and well-suited to the climate of the UK. 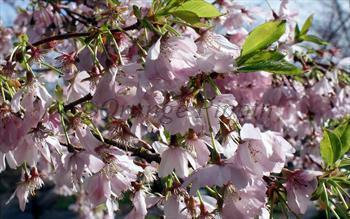 The young branches appear to be weighed down by the mass of pink blossom in the spring. In autumn the leaves develop orange - red tints. Accolade makes a good choice as a medium-sized specimen tree for lawns or avenues. Please fill in the details below and we will let you know when Accolade flowering cherry trees are back in stock.